It’s cognitive dissonance because we believe we need something…even though, in practice, it’s not something we get much value out of. I’ve been beating a fairly persistent drum over the past few years that is a pretty simple rhythm. But, it’s also an, apparently, somewhat radical departure from long-established corporate norms that have not evolved, even though the tools we have for analytics have advanced dramatically. 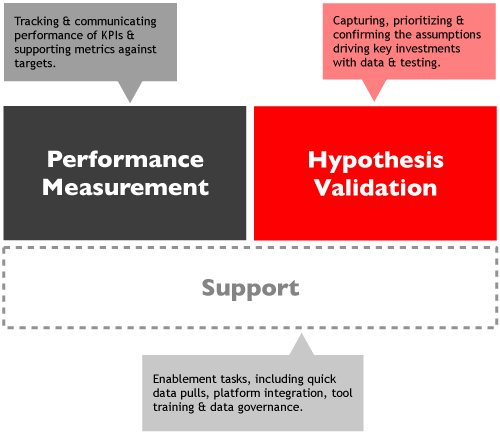 There’s a temptation to look at the above image and make the leap that “performance measurement” is “reporting” and that “hypothesis validation” is “analysis.” I’d be fine with that leap…if that’s how most businesspeople actually defined the words. And they don’t. The only recurring reports are: single-screen dashboards with KPIs (with targets) organized under clearly worded business goals. They are automated or semi-automated and are pushed out to stakeholders with minimal latency on whatever schedule makes sense. If it’s a weekly report that runs Sunday through Saturday, and the recipient actively uses email, it hits their inbox (embedded in the email body — NOT as an attachment) on Sunday morning at 12:01 AM. It’s got clear indicators for each KPI as to whether the metric is on track or not. It does not include any qualitative commentary, insights, or recommendations (see my last post). Additional information is delivered in an ad hoc fashion and is driven entirely by what hypotheses were prioritized for validation, when they were validated, and who actually cares about the results. The core “results” are delivered on no more than five slides or pages (and, ideally, fit on 1 or 2). When appropriate, there is a supplemental appendix, a separate detailed writeup that goes into the methodology and detailed results, and/or a reasonably cleanly formatted spreadsheet with the deeper data. Yup. That’s my dreamy dream world. But, sadly, although common sense says that makes sense — both from saving analysts time and preventing narcolepsy-by-PowerPoint — that is a too-radical shift for most companies. Let’s get a little pragmatic. Harry Potter had less trouble taking out Voldemort than he would have had if he’d tried to drastically curtail the volume and length of corporate monthly reports. That’s it. It’s in the stakeholders’ inboxes on the first day of the month. Everyone knows at a glance if anything has gone awry performance-wise. If something in that limited set of data is unexpected, the recipients are asked to quickly respond. In many cases, someone on the distribution list will already know what the root cause is, (“Oh. Yeah. We turned off paid search 3 weeks into the month. We forgot to let everyone know we’d done that.”) In other cases, a KPI’s miss of its target will be cause for immediate concern, and the root cause is not immediately known. That’s good! Better to have the alarm raised on Day 1 rather than on Day 9 when a “full report” is finally made available! The more people hypothesizing early about the root cause, the better! A slide listing all of the questions (hypotheses — in plain English!) that were tackled during the previous month and an indicator as to whether each question was definitively answered or not (some of these may have been spawned by the initial dashboard — trying to get to the root cause of a problem that manifested itself there), and an indicator if there is action that should be taken for each question. It’s a simple table. One slide for each question that was definitively answered — the title of the slide is the question. Big, bold text underneath provides the answer. Big, bold text that summarizes the recommended action (“No action warranted” is an acceptable recommended action, as long as there is a different potential answer to the question that would have led to actual action). The body of the slide is a clean and clear set of context (including a chart or two as warranted) providing the essence of why the answer is what it is. A single slide of “(Preliminary) questions to be addressed this month.” Some of the questions that were not definitively answered (from slide 3) may be included here if additional work will likely support answering them. That’s it. It’s still pretty radical, but it can safely be labeled a “monthly report” because it has a defined structure and has multiple pages! The last slide is “Preliminary” because, if the report is presented to stakeholders, this is the opportunity to look ahead from an analytics perspective. You have your audience’s attention (because you’ve delivered such useful information in an easy-to-consume way), and you want to now collaborate with them to make sure that you are spending your time as efficiently as possible. It quickly becomes clear that the last slide in this month’s report is the basis for the third slide in next month’s report (other questions will come in over the course of the month that will adjust the final list of questions answered), and it will help stakeholders learn that analysis isn’t merely an after-the-fact (after the end of the month) exercise — it starts by looking ahead to what the business wants to learn! Sometimes, a campaign runs for a short enough period of time that there is only a single “report” rather than a recurring weekly or monthly report. In these situations, the structure is still very similar. But, the “questions” in the last slide are limited to “questions to be answered through future campaigns.” Otherwise, the structure is identical. What do you think? Would this report structure work in your organization (it’s not a theoretical construct — I’ve used it with multiple clients and it’s a direction I try to subtly evolve any report where I inherit some other report structure)? This is absolutely fantastic. I really love this compromise especially in a world where most companies don’t know the difference between a dashboard and a report. 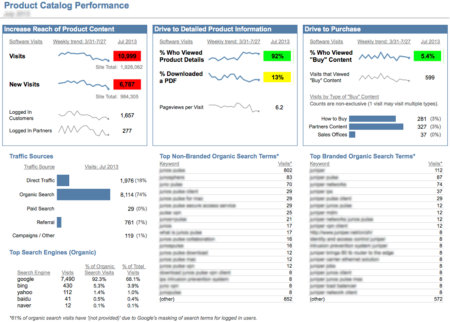 How many companies have you come across where they send your their KPI report, when in fact this should be a 1 page dashboard, and it is a 32 slide excel spreadsheet? That’s a point that we — both analysts and our stakeholders — don’t acknowledge head on. We spend so much time coaching analysts that they need to really deeply understand the business (which they do!) that we inadvertently undervalue the knowledge of the business users we’re supporting and set an expectation that analysts need to be delivering (on a schedule) totally surprising insights simply digging into the data. Hah! See my Susan Powter pic in this post! Is that how you feel when you get one of those multi-pagers? 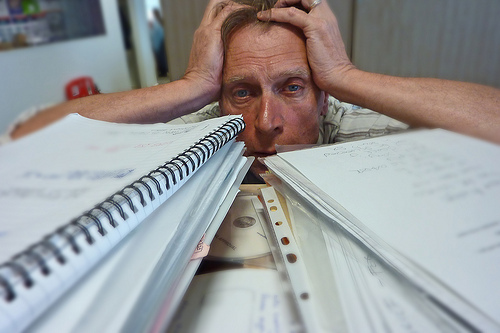 I often find myself building many-tabbed workbooks. And, I even will distribute those workbooks. But, it is very rare for more than 1 or 2 of those worksheets to be unhidden, and the ones that are unhidden stick to the “one screen” rule pretty strongly. I’ve even started occasionally using xlVeryHidden — a trick I inadvertently picked up from fellow Demystifier Kevin Willeitner.